EHS students, faculty and staff are excited to welcome the newest additions to our faculty: Prof. Andres Cardenas and Prof. Jay Graham. Please join us in welcoming them to Environmental Health Sciences! 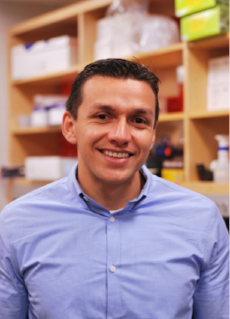 Dr. Andres Cardenas develops and applies computational approaches in environmental epigenomics, examining molecular and epigenetic targets of exposures to environmental hazards and their role in the development of disease. He is investigating the prenatal influence of metals, air pollution, endocrine disrupting compounds, diet and prenatal maternal medication use on the epigenome of infants and children. His current research evaluates the role of environmental exposures in utero, epigenetic modifications, and their potential role in the developmental origins of health and disease. Prior to joining the Berkeley faculty, Dr. Cardenas was a postdoctoral fellow at Harvard University. Dr. Jay Graham's research applies epidemiologic methods and next-generation DNA sequencing to refine our understanding of the spatial and temporal transmission of antimicrobial resistance (AMR) and zoonotic infectious diseases. He has worked collaboratively in many settings in Latin America, Asia and Africa, and has extensive experience working on the US-México border where he conducted research on the primary prevention of diarrheal diseases and pneumonia within informal settlements of Ciudad Juárez, MX. His work has contributed to more efficient and cost-effective approaches to scale-up public health initiatives for the prevention and control of infectious diseases. Dr. Graham holds an M.P.H. and an M.B.A., and he received his Ph.D. from the Johns Hopkins Bloomberg School of Public Health. Prior to joining the Berkeley faculty, he served as a AAAS Science & Technology Policy Fellow within the Bureau for Global Health at the United States Agency for International Development (USAID), where he provided technical leadership on water, sanitation and hygiene and household air pollution programs. He also served on the faculty of the School of Public Health at George Washington University, where he directed the graduate program in Global Environmental Health.